Play Tidal Riches™ online for free now! The slot machine Tidal Riches definitely has got what it takes to become a cult game! Why? Because this cutting-egde slot sets new standards in terms of gameplay! That's reason enough for us to welcome this masterpiece with familiar Novoline quality into our online casino. Should you play Tidal Riches for the first time online, then you better get ready for the odd surprise. For one thing, you can try this slot machine free on GameTwist if you have enough Twists in your player account. Secondly, you will be amazed because the playing field can increase from 15 to 30 reel fields! Here we have some tips for you to make sure you fully enjoy Tidal Riches online. Moreover, we reveal which special features this slot has. 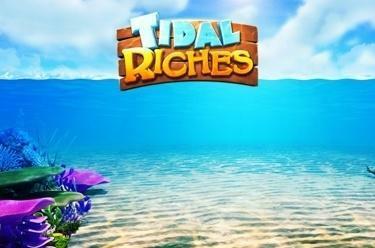 Tidal Riches is a cutting-edge slot with up to 50 win lines that is all about the ocean. 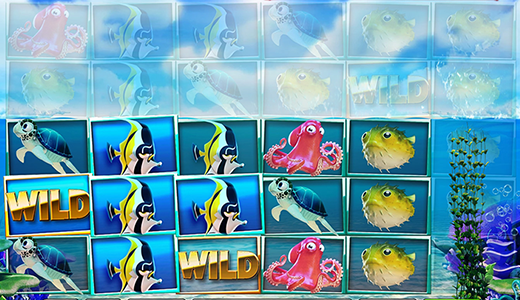 This slot machine has an exceptional reel set which can increase after winnings—from 15 (5x3) reel fields with 20 win lines to up to 30 (6x5) reel fields with 50 win lines. Besides Free Games this game features a Hi-Roller-Mode where you might play with Mega Wilds twice the size among other things. earn huge winnings. Your account will be topped up with Twists from three matching symbols. When a winning combo lands, winning symbols burst and are replaced by symbols dropping down. With a little luck you might enjoy a winning chain reaction and the arrow counter for Free Games and Bonus symbols might be filled rapidly. The WILD symbol can substitute for any other symbol to complete winning combos. One arrow: the playing field increases to 6x3 reel fields with 20 win lines (that pay in both directions). Two arrows: the playing field increases to 6x4 reel fields with 40 win lines (that pay in both directions). Three arrows: the playing field increases to 6x5 reel fields with 50 win lines (that pay in both directions). Four arrows: five Free Games with additional Treasure Chest symbols (that reveal matching winning symbols). Five arrows: more Treasure Chest symbols for the free games. Six arrows: large Treasure Chest symbols (2x2 fields) for the free games. Seven arrows: enormous Treasure Chest symbols (3x2 fields) for the free games. The special thing about it: you might earn further free games during free games, because the free games have a seperate counter which will only be emptied if no win has been achieved after a free game spin. Four arrows: four additional free games. Five arrows: six additional free games. Six arrows: eight additional free games. Seven arrows: ten additional free games. Only the most recently achieved number of free games will be added. Would you like to take more risks with Tidal Riches because you have enough Twists that you can bet free of charge? Then this Novoline game won't let you down. Because the Hi-Roller-Feature enables you to play with higher stakes in Silver and Gold mode and increase your chances of winning! Silver mode: 5x standard bet for three spins with Mega Wilds. Gold mode: 10x standard bet for three spins with Mega Wilds and fixed arrow fields that won't be emptied after spins without wins. Tidal Riches from Novomatic: this slot is a trailblazer! There are not many slots around with dynamic reel fields that change when winning. This innovation brings more gaming fun to your computer, smartphone or tablet as well as surprises which older casino slots are lacking. And because Tidal Riches also features lovable game design and amusing symbols it is in a league of its own. Besides Tidal Riches many more slots are available on GameTwist that keep pace with the times in terms of gameplay. The slot From Dusk Till Dawn, for example, that is about the iconic Hollywood movie of the same name, offers countless Bonus Features and the chance for a Jackpot which is a sure-fire hit with our players! The Novoline hits Tales of Darkness or Legends of the Seas are also outright stunners with thrilling action like you've never seen before. Sahara, a game that treads in the footsteps of Book of Ra, has also got what it takes to be a slot superstar. Which of these top games will you give a try?